For us, dog owners, our pooches is a vital part of our family. If you’re so like, you probably even treat them as your child; so getting the best leather collar for them is really important. 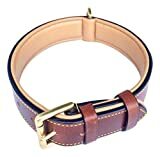 Getting a poorly made leather collar may actually make your dog uncomfortable while you’re taking them out for a walk. This would just make the walk unenjoyable both for you and for your dog since they would definitely keep on tugging and resisting while you walk. After having a dog for most of my life, there have been a handful of times when the collars I got just completely failed on me. This is due partly to it being cheap or not being the right material for my dog. A low quality dog collar can cause a lot of problems. For one, it would make it harder for you to walk your dog if they can easily release themselves from the collar. Your dog might also feel suffocated and get restless while walking. What to Look for in a Leather Collar? How to Get the Right Size Collar for your Dog? 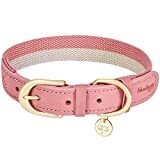 When I first saw the picture of this collar while I was looking for new one for my pup, I initially thought it would for sure be expensive but it is pretty affordable. I absolutely love that this can be customized at no additional cost. You can even choose the font you want as well as the design on the collar. This is a perfect way to replace the usual dog tags which don’t really have much personality. The name of your dog and your phone number could be engraved on the collar. I also love that it is made of genuine leather so it won’t break off easily. Another great thing about this collar is that it has four different sizes so it can definitely fit your dog no matter what the size. This is a huge plus because a lot of collars just rely on the fact that they are adjustable and this just won’t do because collars should never be one size fits all. The only thing you should be very careful of the measurements. It’s very easy to measure incorrectly and this would just cause a lot of shipping back and forth. I loved that you can personalize the collar with your dog’s name and your number. You can get your money back guaranteed. The leather is thick but not thick enough to withstand constant chewing so it could snap off. It might be a bit too thick for puppies and really small dogs. If you are looking for a luxury leather collar for your dog then, here is exactly the one for you. Me and my dog loved how soft the quality leather felt. There is also a built-in small ring where you can hang a dog tag. Another amazing thing about this is that it has a lifetime warranty and this just shows how confident the people behind this are with their product. However, since it is made of very high-quality leather, it comes with a heftier price tag. Aside from what I have mentioned, I also love that they do not add any harsh dyes or chemicals to the collar. This means that there's no chance that the color would fade on my dog’s fur. However, since it is made of very high-quality leather, it comes with a heftier price tag. It is very soft and does not irritate my dog at all. The quality of the leather is amazing. It is more expensive than most collars on the list. What really drew me to get this collar was how stylish and elegant it looked. It has lambskin padding so it is very soft and does not cause any discomfort for my dog. It also doesn't rub his fur so he doesn't get irritated or feel itchy. The metal detail on the collar is not only a styling addition but it is also very practical since this means that it would be durable enough to last a long time. The only thing that really disappointed me was the lack of enough information when it comes to size so I had to rely on others reviews. The stylish and classic look of the collar. The lambskin padding makes it very comfortable for my dog. There was no direct information on the sizing of the collars so it causes a lot of confusion when you are purchasing. This is a very unique leather collar. It is not just made of leather but it also has polyester in it which allows greater flexibility so when your dog moves around no discomfort would be felt. Aside from this, the design of the collar is also great. It looks so chic and stylish and would definitely make your dog a head turner. Again, with something as stylish as this, it does come at a price. Although it’s not on the higher end of prices it is still more expensive than the other options. The chic, and stylish design. The combination of leather and polyester makes it more flexible and comfortable for your dog. It is more expensive than the other collars. There are only limited sizes available. I am not going to lie, the thing that really drew me to this leather collar is the price. It is way cheaper than what you would usually see with other leather collars. There are also ten color available so you have a lot of choices. I also love that it has five adjustment holes so I can fit the collar accordingly when my dog’s fur starts to get longer. However, since it is affordable you can’t expect it to be the same quality as the other options. I actually noticed that the black color on the inside of the collar is rubbing off on the white fur on my dog. It is very very affordable. It does not feel like it is genuine leather. The color of the lining is rubbing off on my dog’s fur. There are certain things that you should specifically look out for when getting your dog’s collar. I have listed down what I believe are essential in a really good leather collar. The number one criteria for me is always durability. This is really important especially since the collar would be attached to your dog most often than not so making sure that the leather won’t just break apart one day is important. 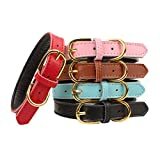 Since you would be walking your dog everyday or almost every day, getting a leather collar that can withstand the tugging of your dog is also very important. To check for the durability, you should look at the quality of the leather itself. Looking at the stitches on the collars can also give you an insight of how well the collar was made. The collar should give your dog comfort and not add any stress to them. This would allow your dog to be happy and would actually train them to like being on a leash more. Leather collars that are very uncomfortable could also cause neck problems to your dog so you should definitely stay clear of these. Usually, comfortable collars would be lined on the inside as well so it is soft. Another great feature that I recommend you should look for in your collar is the name tag. Of course, this isn’t really an essential but it is very convenient. This would mean that your collar is multipurpose. 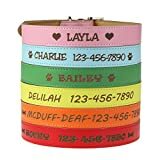 Name tags don’t need to be already attached to the collar but it would be great if it is easy to attach a name tag to the collar. Getting the right size collar for your dog is optimal for them to have a comfortable walk. This would also make it easier for you as a dog owner. When I first got a dog of my own, it took me forever to figure out how to get the right size for him since I had zero clue on what I should look out for. It was even harder for me since my dog was a Pomeranian and Japanese Spitz cross so there weren’t a lot of sites available back then to help me choose. After numerous failed purchases, I have finally found the best formula to get the right size for my dogs. Also if you are looking for leather collars for small dogs I found some from GenuineCollars. Below are the things I have found to be useful to consider when it comes to getting the right size for your dog. The first thing to consider is the neck size of your dog. Measuring this would guide you on the right path when it comes to purchasing the right collar. To measure, you should get a cloth measuring tape since this would be less irritable for your dog. The general rule is to add an inch on the measurement for smaller dogs, two inches for medium sized dogs, and three inches for big dogs. This would ensure that the collar is not too tight and there is enough room for your dog to breathe and move around but, not too loose that they could take it off. In general, the neck size would be enough to get the right size collar but, if you have a furry dog like a Chow Chow or Shih Tzu taking the fur length into consideration is optimal. If you get your dog groomed regularly, getting the neck size right before grooming and after grooming would give you a general idea on the right collar size. It’s best to get an adjustable neck collar so your pooch won’t be uncomfortable once their hair grows. The length of the collar is not that only think you should look at, the width is also very important. Collar width usually depends on the size of your dog and how active they are. The more playful and resistant the dog is, the thicker the collar should be. This would give you better control when you are walking your dog. Of course, if you have a smaller dog like me, you can’t get a really thick collar no matter how playful they are because it would just be too big so consider this as well. All the leather collars above are amazing but I have to say that the one from Custom Catch is my favorite. I love that you can personalize it for your dog. This actually saves you the hassle of getting a dog tag. I also love the overall look of the collar and how well it suits my pooch. Finally, it gives great comfort to my dog and I think this is the most important criteria. Do you agree with my choice? Did I miss out on other great dog collars? If so, then please comment your opinions and other suggestions below.